Buford Betty: IVF: We made it! This morning was soooo not as big of a deal as I made it out to be! I did pop a couple of Tylenol about an hour before the procedure, which I think definitely helped. And my friend, Jill, gave me a good strategy for downing the water beforehand. My bladder was plenty full after only like 28 oz and was not at all uncomfortable. I mean, sure I needed to pee, but not quite the misery I had anticipated! Isn't it a beaut?! 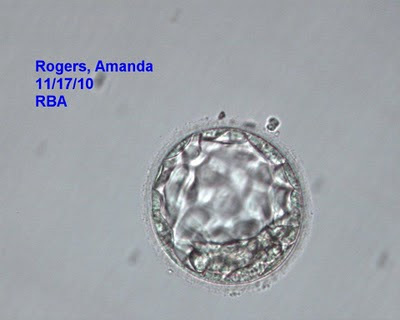 We're hoping this is baby's first picture, but either way that's a purty little embryo, don't you think? Of our 14 embryos being watched, 5 made it to this blastocyst stage. We transferred one and the other four were frozen today. The rest of our 14 are being watched for one more day to see if any of those will mature to blastocyst stage, and those will also be frozen. So as of today we have 14 frozen (with the 10 initial frozens from day 1) and the possibility of more! Wow! So thrilled to have those babes on ice. I've said it before - even if this first cycle doesn't work out, we are grateful to have gotten these little frozens! Dr. T said we were the poster children (as for as how well we've done so far) for IVF! Oh, and we did ask the embryologist about the fact that he used ICSI on all 30 of our mature eggs... and he confirmed that there was some concern over the sperm's ability to fertilize, so they went ahead and manually fertilized them all. Not that we want to add another "issue" to our already lengthy list of reasons why we can't get pregnant, but that is WAY cool to know. We obviously can fertilize on our own since we did get pregnant initially from an IUI last year, but we apparently have some kind of difficulty with fertilization. So wow, we're done! All the hard work is done. What an intense couple of weeks it was... and now we wait. I'm due for a blood test the Monday after Thanksgiving, so it's not quite a two-week-wait, but close. I'm just focusing on taking it easy, sticking to my high protein diet and all things Moo Goo, poppin' all my pills and drinking my Noni juice. Thanks SO very much for following along! Your sweet comments, tweets, and prayers have been so uplifting and encouraging! I can't tell you enough! I'll keep you updated on how it's going, but yay for being on the other side of this. Now I can really look forward to enjoying Thanksgiving and actually think about some OTHER things! Oh my!!! This is soooooooooo exciting I can hardly even take it! BEAUTIFUL!!!! Amazing! Love it!!! Glad you got to "be on CSI" too...tee hee! Love you girl! Yay yay yay!! You truly are the poster child for IVF!! Praying for you in these waiting days - either way, so much to be excited about, praying BIG that this little one settles in for the long haul! What good news! I was so happy for you guys when I read this! Thinking positive thoughts for that cute embryo to settle in for the next 9 months! SOOO exciting! Rejoicing with you that things went so well!! I'll be praying for you and your little embryo, which really is quite beautiful. :) Yay yay yay! So much to be thankful for this Thanksgiving! So glad it went well! You've been in my thoughts and I was hoping to hear good news! Awesome News. I have been following you forever. I have 14 yr old twin girls that are RBA-IVF Babies. Your description of those doors opening is hilarious. That's one portion that is clear as day in my memory!! Woo hoo! Glad it went well. GOOD LUCK!